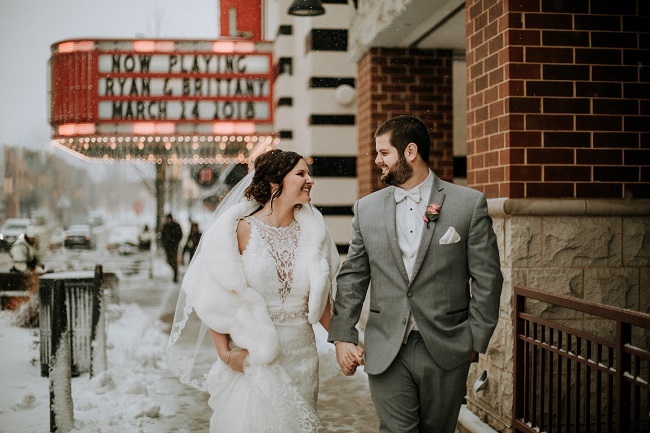 Bloomington-Normal Wedding – Ryan and Brittany – Spring Snowstorm!! 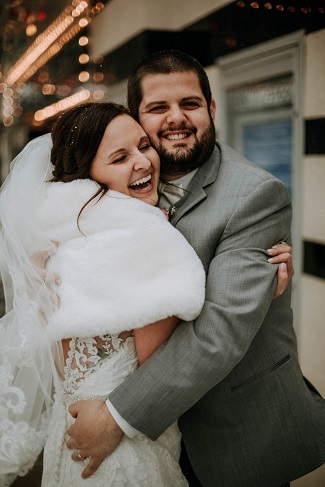 When you are planning your wedding for the last weekend in March and the temperature has been in the 50’s all week, the last thing you are anticipating is a spring snow storm!! 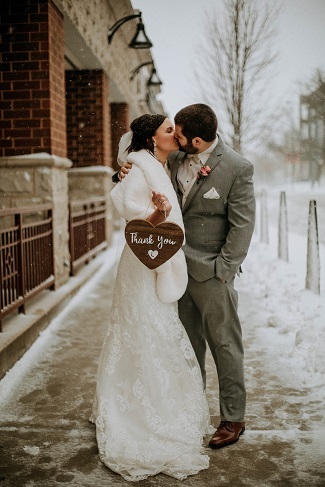 For Ryan and Brittany, that is exactly what happened on their March 24, 2018 wedding with a mix of sleet, heavy snow and freezing rain which also prevented some out of town guests from attending. All in all everything about the day was perfect…except for the weather; however they did not let it ruin their happiness and said it made for a few great “but brief” outdoor photos and was certainly memorable!! 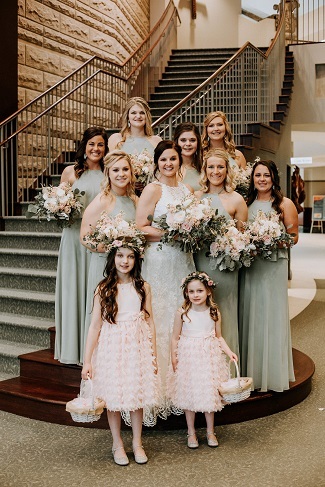 Although they were missing the spring weather, inside it was all spring with sage green bridesmaid dresses and bridal bouquets, table centerpieces and church decor in soft blush and peach blooms – perfect colors for a spring wedding!! Brittany found inspiration on Pinterest for her wedding color palette after seeing photos of light green bridesmaid dresses. 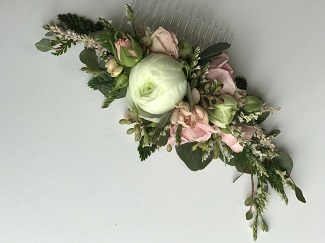 She then incorporated the soft pink and blush for the wedding flowers and groomsmen vests & ties. Because her dress was ivory, she chose ivory linens and accent flowers with silver embellishments to make things pop. Even though she had a full year to plan, Brittany said there were still not enough hours in the day with working full-time and and just encountering life’s obstacles! Therefore every open weekend was dedicated to wedding planning which paid off in the end. 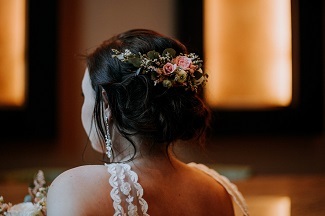 She also felt fortunate that a lot of what she wanted worked in her favor and she didn’t have any problems booking vendors, so she felt like she had an overall easy wedding planning process!! 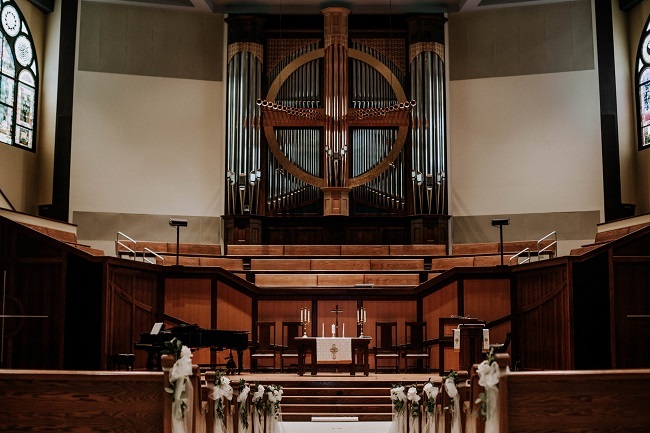 They were married at Second Presbyterian Church in Bloomington which contains a gorgeous pipe organ and has beautiful stained windows. 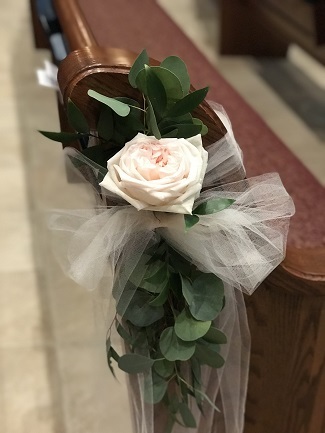 We decorated the pew ends with blooms and mixed greens and tied them to the pew with tulle. 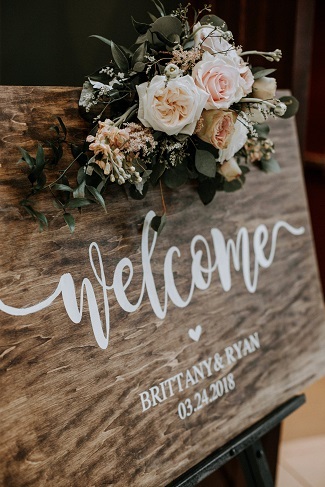 A friend crafted their welcome sign which we adorned with a floral spray. 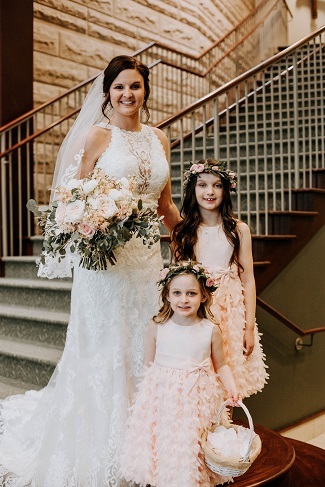 Brittany did a lot of planning on her own, but when she felt indecisive she could count on her mom and bridesmaids to help and be supportive and encouraging. She especially enjoyed the quality time she spent with them planning and it was not only fun and made it more stress-free, but they were a big help which made her life so much easier!! 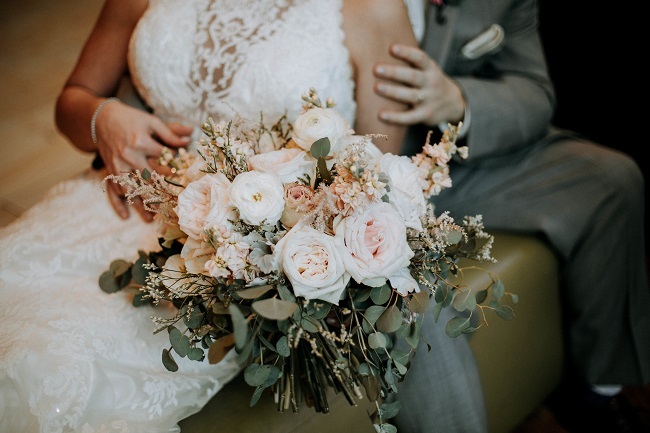 Brittany’s vision for her flowers were for soft colors with a garden feel. 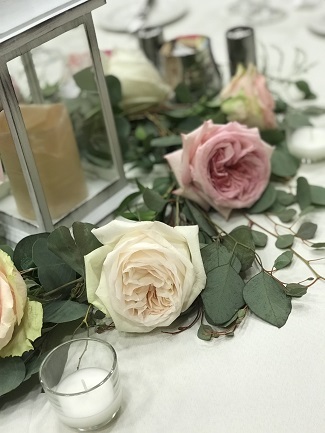 We used a mix of blush and peach garden roses, peach stock, blush astilbe, white ranunculus and mixed greens of assorted eucalyptus and limonium filler. 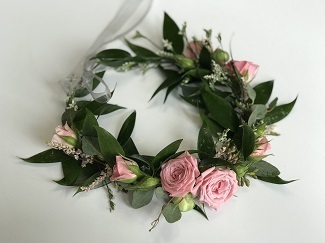 Brittany thought of all the little details including a floral hairpiece which she wore in her hair at the reception and sweet little flower girl crowns with darling little spray roses for them to wear in their hair!! 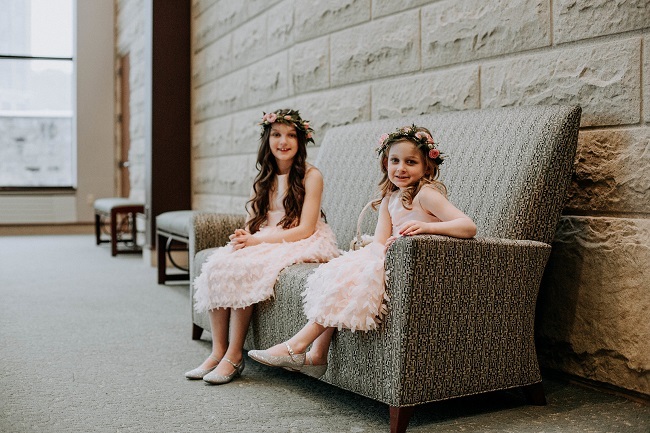 Love these ruffly, blush flower girl dresses with their sparkly shoes and so sweetly wearing their floral crowns!! These gorgeous photos were by Dani Lang Photography. We love this pose of Brittany in her gorgeous ivory lace dress holding her wedding bouquet!! 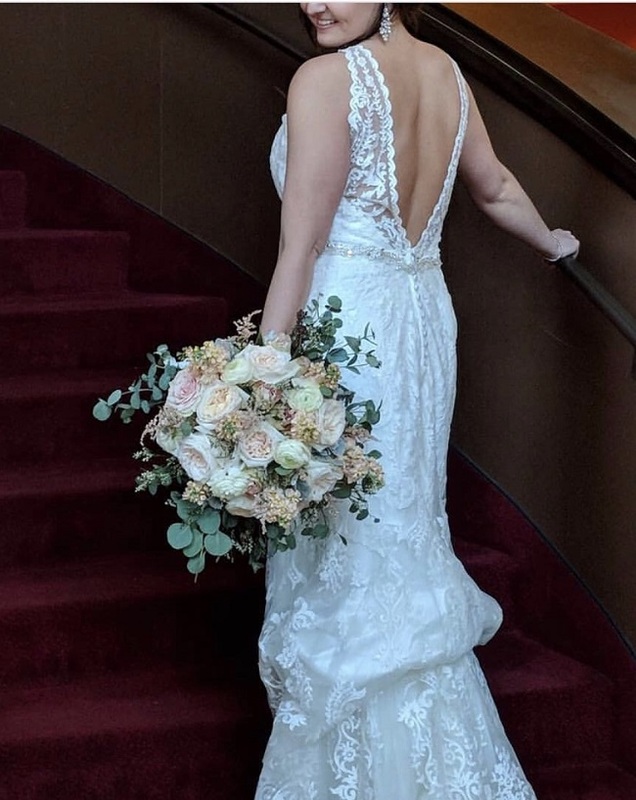 One of our favorite parts of being a wedding florist is handing off the wedding bouquet to the bride and seeing her reaction. Brittany was overwhelmed with tears of joy at seeing her bouquet and her support system (mother & bridesmaids) quickly admonished her not to ruin her make-up!!! 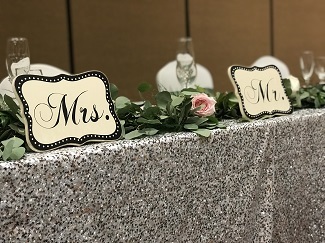 The reception was held at the Marriott in uptown Normal, IL. 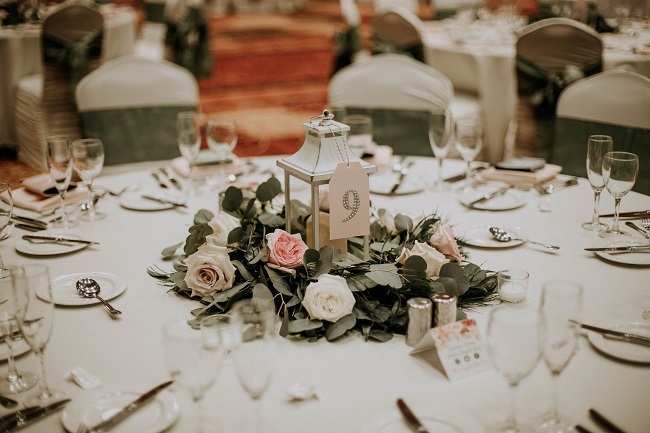 All the tables had silver lanterns which we surrounded with mixed green garlands and inserted blush and pink roses into the garlands. The head table had a full mixed green garland running it’s length and to the floor with blooms interspersed as well as candles. Brittany’s best advice to newly engaged couples planning their wedding is to relax and enjoy the process!! She feels that investing in a planner is a life-saver as it does get stressful at times, but staying organized, not trying to do it all at once and leaning on your support system for help will pay off when you see it all come together on your big day!! It also helps to drink lots of wine and keep smiling!!! Are you wondering how the snowstorm affected the flower delivery? 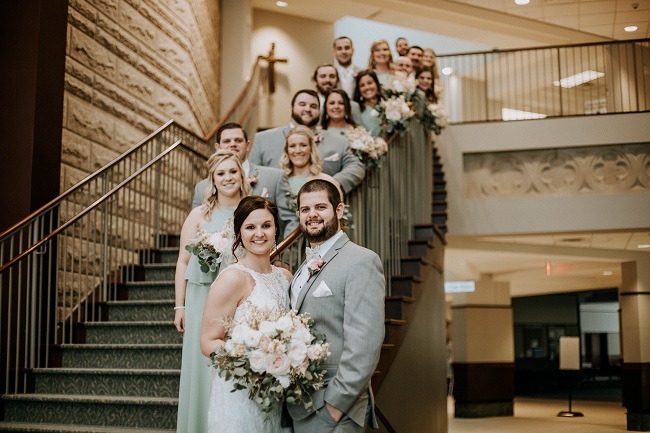 Well, we played it safe and brought all the flowers to the Marriott ballroom on Friday evening, then checked in ourselves and spent the night so that we found ourselves and the flowers safe from the brutal road conditions Saturday morning!!! 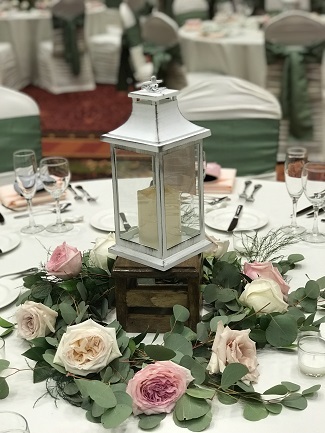 We would love to work with you to create your vision for your wedding flowers – call or text 309-212-6570 or email us at fancyfloralsbynancy@hotmail.com to receive your free consultation! !